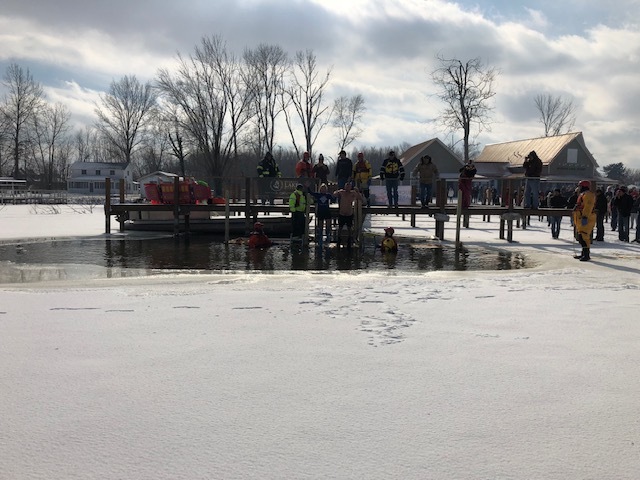 THORNVILLE, Ohio – Buckeye Lake’s Region Chamber of Commerce hosted Winterfest this weekend where attendees were able to explore Buckeye Lake and the activities they had to offer, including the annual Polar Plunge at Buckeye Lake Winery. The Sixth Annual Polar Plunge took place at the Buckeye Lake Winery, where participants jumped into the lake, wearing costumes or not, and this was all to raise money for charity. The Polar Plunge has always been a charitable event for the Friends of the Buckeye Lake Library. “We hope to raise at least half of the rent expense for them with this event today,” said Owner of Buckeye Lake Winery, Tracy Higginbotham. The Friends of the Buckeye Lake Library offers many services to the community and what better way to support them than by offering an exciting event. “The Library does a lot of good, job searches, supports education. Throughout the community, it’s a real gem to have,” Higginbotham added. It costs $25 to register for the Plunge, and you receive a t-shirt and a celebratory beer. Millersport Fire Department was present to make sure all the jumpers were safe and to be there for extra support. There were close to 40 jumpers, ready to take on the freezing Buckeye Lake. “It was really cold, it was miserable. So this is my first year jumping, I did not anticipate it to be that cold. I tried to channel my inner Wim Hof Iceman, but it did not work,” said Plunge Jumper and GM of Buckeye Lake Winery, Chris Riley. Even through the freezing temperatures, the Buckeye Lake community will be looking forward to this cool event every year.